It’s always great to have some sunshine but sometimes it’s also nice to sit in the shade knowing that the sun is still shining. 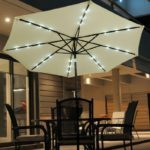 Enhance the look of your garden furniture by having a parasol, it’s also portable so you can place it anywhere in your garden. 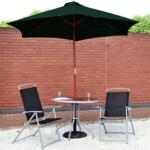 A garden parasol can be convenient by providing shade when you’re relaxing on your sun lounger or garden hammock. A garden parasol is space efficient as it can close up, so when it’s not in use and during winter months it can be stored away. Most of the garden parasols will come with a crank handle which allows you to wind open or close the canopy. The parasols without a crank handle can still open and close but it’ll just require more effort. 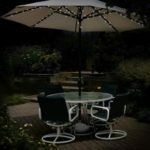 Most of the parasols in the table will have alternative colour options available so you can choose accordingly to match with your garden. 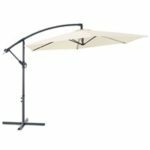 We have reviewed and compared each of the parasols to determine what position it should rank in our top 10 garden parasols table, however, this is only a guideline because your final choice may depend on personal preference and what type of garden you have. 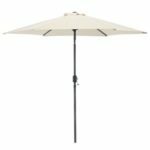 Freestanding or umbrella – Freestanding parasols better known as cantilever parasols, allow you to freely place it anywhere in the garden. 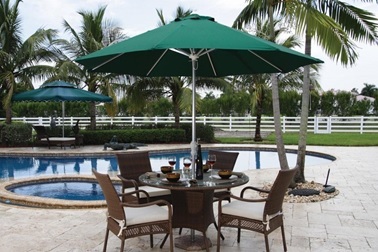 These types of parasols do still require a base to hold it in place as mentioned below. With umbrella parasols most people tend to place it through the centre of their garden table, so choose an umbrella parasol where the diameter is wide enough to provide shade for the number of people that’ll be sitting around the table. 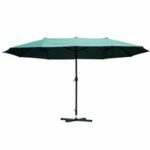 Height – This will usually be fixed, however you can get height adjustable garden parasols which means you can also control the amount of shade it will provide by lowering or increasing the height. Canopy diameter – The wider the canopy diameter the bigger the area it will provide shade to. The size that’ll be suitable for you could depend on the size of your garden, number of people you often have over and how much sunlight do you actually want to block out. 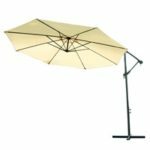 Base – Usually the parasol base has to be purchased separately, for the parasols requiring a base you would need to know the diameter of the pole so you can buy a base that’ll fit the pole. 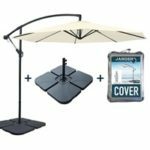 We’ve included the diameter of the pole for the parasols requiring a base and we’ve suggested what base to buy in the table above. 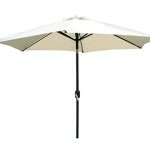 You can buy a heavier parasol base if you prefer more weight to secure the parasol. 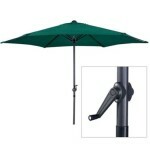 For those who are looking to buy the best cantilever parasol, there are many ways to secure one. We have listed a few different ways below on how to secure a cantilever parasol. 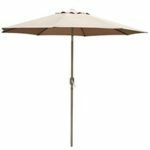 Tilt – Most of the garden parasols will include this feature, but it can be very handy to have as tilting the angle of the parasol can provide more shade without having to move the parasol. Cantilever parasol base weights – The most common and probably the safest method is to buy base weights designed specifically to secure a cantilever parasol. Concrete blocks – Placing concrete blocks on top of the base can also be enough to secure it. However, it’s unlikely the blocks are going to be an exact fit for the base, so you will need to make sure it’ll securely hold down the parasol. Sand bags – A great cheap option if you happen to have spare sand bags lying around. Providing you have enough sand bags, using these should safely secure the base. Still can’t decide which one to go for? No problem, check out the pros and cons between the two below, this should be enough for you to decide. Much more stylish base designs to choose from. Can place in the middle of a garden table with a hole, this will give everyone around the table an equal amount of shade. Diameter is generally smaller, thus providing less shade. Only useful when it can be placed in the middle. Placed out of the way but hangs over to provide shade. 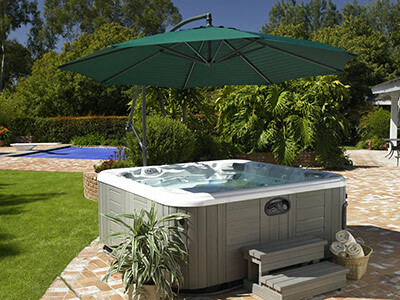 Ideal in situations where you just can’t place it in the middle, such as when you’re sitting in your favourite Lay-Z Spa inflatable hot tub or having a picnic. More upmarket and usually made from higher quality materials. Quite limited with choice on what base weights you can choose, it’s usually more expensive and not very pretty either. More expensive on average and slightly more difficult to set up. Parasol cover and carry case to cover a parasol of up to 2.7m. Made from polyester and can be fastened with the drawstring. Keeps your parasol clean and protected when not in use. High quality cover which easily slides over your 3m cantilever parasol. Polypropylene material makes it water resistant and provides UV protection. Keeps your parasol clean and gives it protection when not in use. 60 LED lights to brighten up your garden when it’s dark. Easy to install by attaching the strings along the ribs and beams. Separate solar panel allows you to position it where it’ll get the most exposure to sunlight.